Today I am using Prussian Blue to develop some of the shapes on the jar lid. Again shape is so important. I am painting the shadows, not the bumps. I am painting around the light areas. 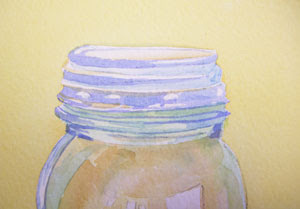 I used Prussian Blue to develop some more shadows in the jar also. I used it around the bottom of the lid, along the left edge, around the darkest shadows in the lettering, and at the bottom of the jar. It is really beginning to take shape!